It’s hard to believe that football season is already coming to an end. Over the last few months, we’ve had parties, cooked amazing dishes and immersed ourselves into the culture that is game day. While it’s slightly sad to think that our weekend celebrations will soon be over, we’re more than excited for one last party to celebrate the biggest game of the year. Since the Big Game is pretty much the pinnacle of the whole season and therefore, the most anticipated game day party I prep for, I’ve upped my game and come up with an easy and delicious recipe that’s sure to make me the most valuable cook at our game day celebration. For those of you who are still in search of the perfect game day snack, these Cheesy Skillet Pizza Bombs are a winner every time! Now, I know that pretty much everyone on the planet has had pizza bombs at some point but these cheesy skillet pizza bombs are next level in both their flavor and how easy they are to make. The kids beg for them on game day not only because they are delicious but because they can help in the preparation of them. 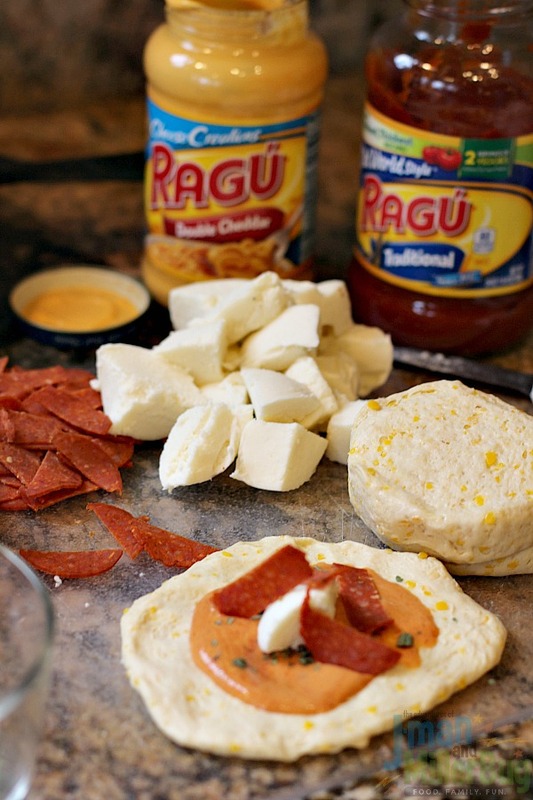 But the true secret to what makes these Cheesy Skillet Pizza Bombs the, well, the bomb is the mixture of RAGÚ® sauces that ooze out of the inside with each and every bite! Without a doubt, this easy dish falls into the best appetizers category and I’m super excited to show you exactly how to make it using delicious RAGÚ® Sauce! 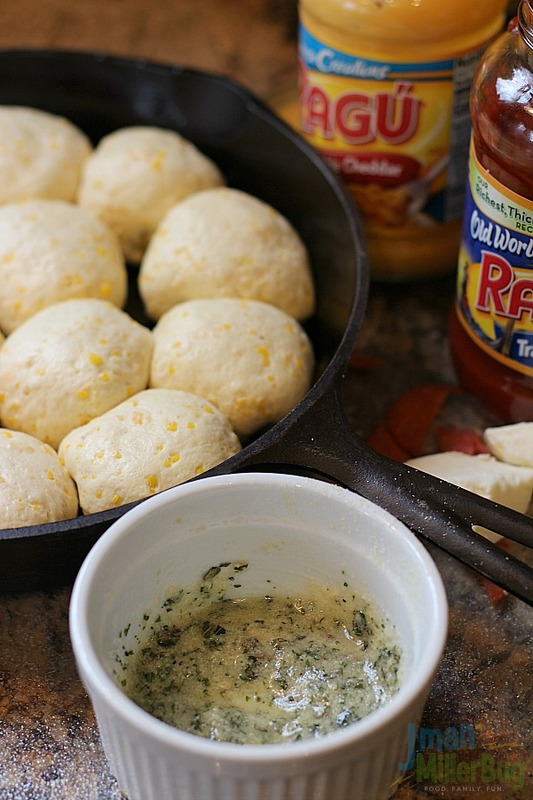 These Cheesy Skillet Pizza Bombs are seriously so simple to whip up and are always a hit on game day! 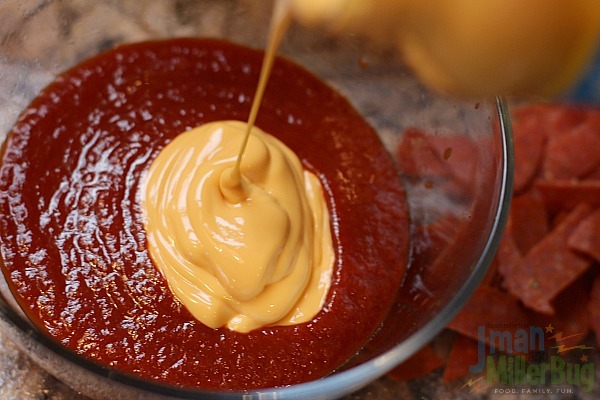 To start, I needed a sauce that would fill my pizza bombs and take them to new levels. 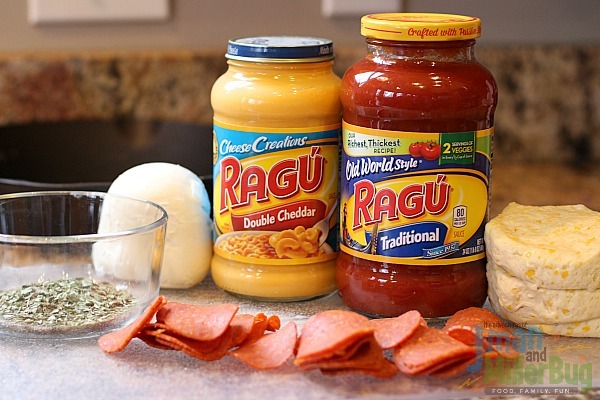 Instead of using pizza sauce, I decided to really add flavor by mixing together my RAGÚ® Old World Style Traditional spaghetti sauce and my RAGÚ® Double Cheddar cheese sauce. Now, if you’ve never tried this combination before, it’s a MUST! While RAGÚ® Old World Style Traditional spaghetti sauce has always been my choice of smooth, flavorful spaghetti sauce that contains two servings of vegetables in every 1/2 cup of sauce, when mixed with RAGÚ® Double Cheddar cheese sauce that features Cheddar, Parmesan and Romano Cheese, the combination is perfection! 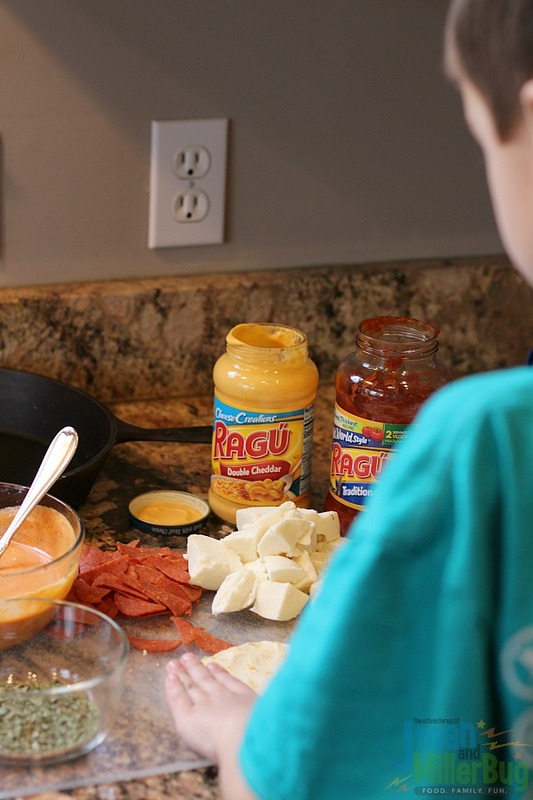 If you’ve been thinking that RAGÚ® Double Cheddar cheese sauce is only for making the Best Mac & Cheese, think again! 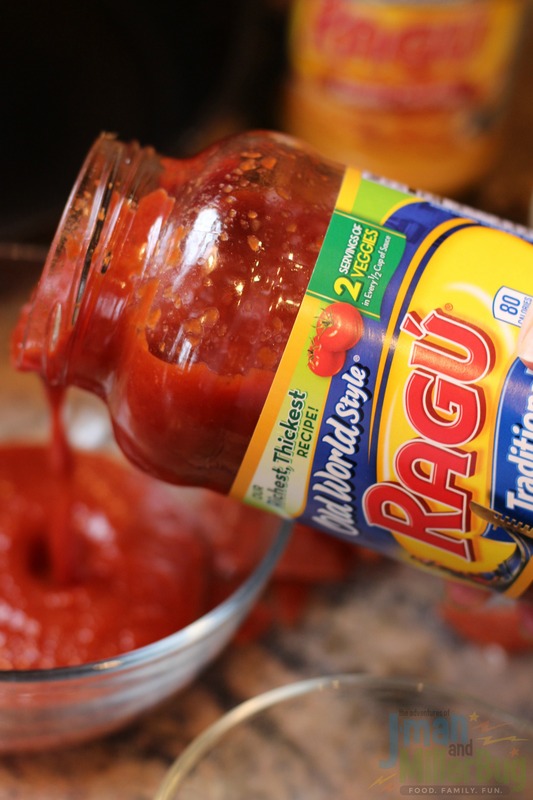 To create my sauce, I added 1/2 Cup of my RAGÚ® Old World Style Traditional spaghetti sauce to a bowl. Next, I added 1/2 cup of my RAGÚ® Double Cheddar cheese sauce to my spaghetti sauce and mixed it together. With my sauce ready, I cubed up my mozzarella cheese and diced my pepperoni so that I had everything I needed to create my Cheesy Skillet Pizza Bombs on hand. 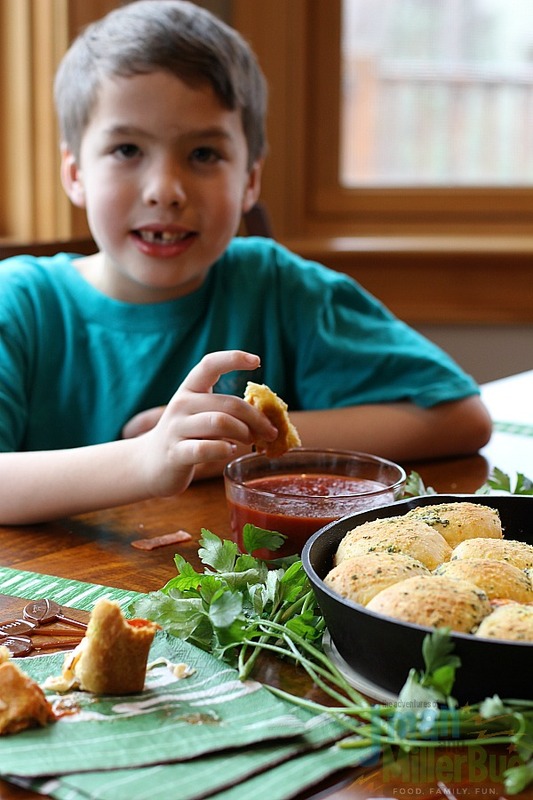 Now, I could have just started putting my pizza bombs together at this point but instead of spending time in the kitchen by myself, I decided to involve the kids and my youngest thought that creating this easy appetizer was so much fun! I let him gently press out each of the biscuits, flattening them until they were almost spread out like a little pizza. 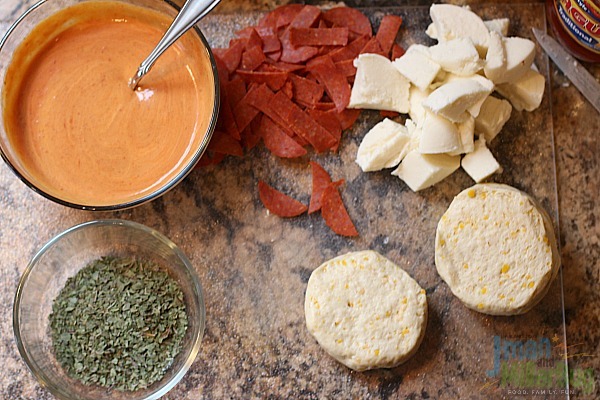 Next, we added a tablespoon of our sauce mixture, a sprinkle of oregano, one of our pieces of mozzarella cheese and a few pieces of pepperoni to the middle of the dough. After gently pulling up the sides, we pinched the edges to seal the dough around the fillings. 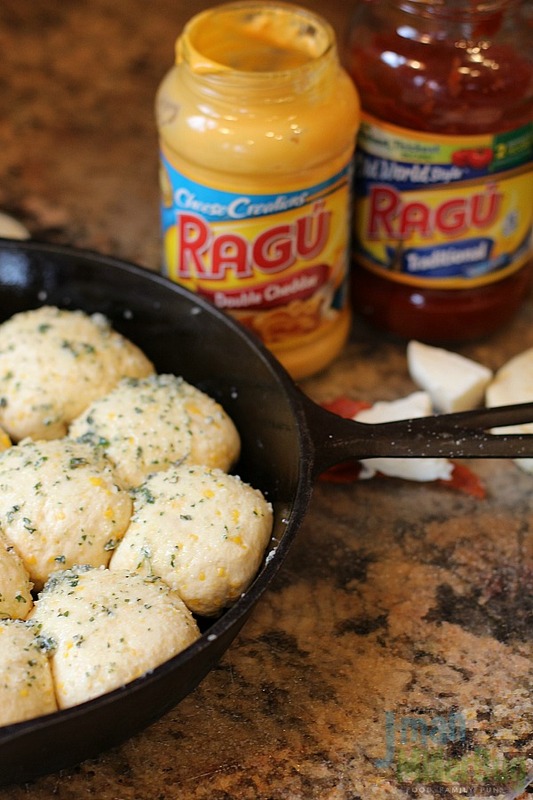 One by one, we added our Cheesy Skillet Pizza bombs to a cast iron skillet that had been rubbed with olive oil. Once we had completed all of the pizza bombs and filled the skillet, I quickly melted my butter and mixed in my garlic powder, parmesan cheese and 1/2 tablespoon of oregano, stirring it all together to make what was almost a paste for the top of the pizza bombs. I quickly brushed my topping onto my pizza bombs and they were ready to pop into the oven. I placed my Cheesy Skillet Pizza Bombs into my oven that was preheated to 350 degrees and cooked them for 35 minutes (Note: the tops of the pizza bombs will begin to brown after about 25 minutes but the extra time is needed to cook these all the way though). Once my Cheesy Skillet Pizza Bombs were cooked to perfection, I removed them from the oven and heated up my remaining cup of RAGÚ® Old World Style Traditional spaghetti sauce that’s perfect for dipping! Since these Cheesy Skillet Pizza Bombs are big enough to share, my one large skillet was enough to feed all of my game day guests! They simply pulled out one of the perfectly cooked Cheesy Skillet Pizza Bombs and enjoyed the amazing combination of flavors that makes this a must-have game day appetizer! From my youngest guest to my oldest guests, this best appetizer is perfect for any game day celebration! It’s delicious, it’s filling and whether you dip it, dunk it or simply pull it apart and enjoy each melty bite, it’s always a game day winner! Now it’s your turn! 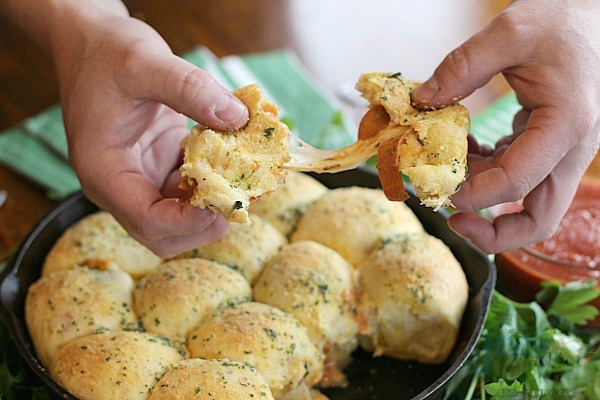 Whether you’re having a Big Game celebration or just watching the commercials with family, whip up these Cheesy Skillet Pizza Bombs as part of your game day celebration! Start by picking up RAGÚ® Old World Style Traditional spaghetti sauce and my RAGÚ® Double Cheddar cheese sauce at a retailer new you today! Then tell me, who will you invite over to enjoy this winning game day dish? My kids are going to love you when I make these for them! These are totally right up their alley! I’m making these soon! We all love cheese, so everyone would be a fan. Yum! Now I’m super hungry after seeing these photos. These look absolutely terrific! Is it wrong that it’s early morning and I could totally go for some of these right now? These pizza bombs look delicious. We could eat these anytime of the day. Heck I can see the kids grabbing leftovers for breakfast. Finally a recipe the kids will love. I’ve been trying to find something easy to feed the grand kids this weekend and this one sounds like a winner. They ‘re so picky and I hate having to cook several different things. Those look absolutely delicious! Perfect for the Super Bowl!! Marketing works. I am totally going to make these! Thanks! I am drooling by just looking at the pizza bomb. I want to make this one sometime this week. With the football games just on the horizon, there is a lot of demand for food and more food. 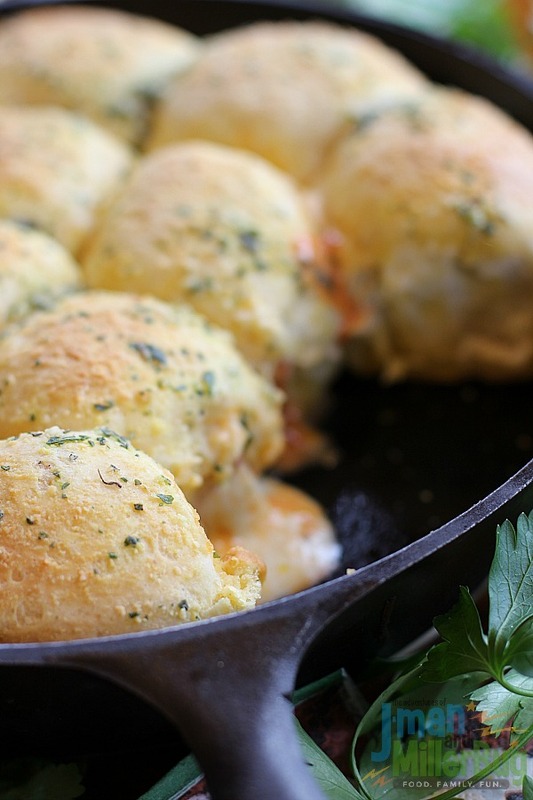 The cheesy skillet pizza bombs look like a show stealer this season. These seem so simple to make! Simple recipes are my favorite. Your blend of flavors sound amazing! This is definitely going on my menu for game day. 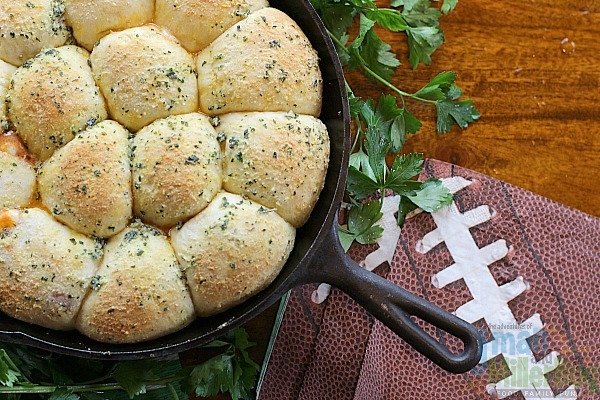 I’m sad to see football season coming to an end, but these Skillet Pizza Bombs will be the talk of my Super Bowl party. This looks 100% delicious and right up my street! I most definitely need to try and give it a go making this for myself. Pizza bombs!! Say what?? This sounds amazing and such a winner for game day! These look like a delicious dinner or party food. I love anything pizza! those cheesy skilet pizza bombs are so mouthwateringly delish- and I love that they are finger foods too so they are great for a party setting- Thinking these need to be part of my superbowl menu! These look delicious. My kids would go nuts for these pepperoni pizza bombs. Would be a great appetizer for the super bowl or a party. Finding this recipe before the big Game Day is a total win! My guys are going to really enjoy having these Pizza Bombs added to the menu. Talk about a lovely recipe that’s a hit with not just kids, but the adults too. I think this one makes a lovely snack and also a nice addition to your table during parties. Pizza bombs are seriously the best. We make them all the time because they’re so easy and quick. Ooh, now that is a darn good recipe! I might have to make this for dinner. Those look amazing. Now this is something that my family would enjoy. I can’t wait to make these for dinner soon. I know my family is going to love them. These look good. We make these all the time at our home too! These are the bomb! LOL Seriously my kids would love these, my little pizza fanatics! I so have to make them these! Yum! I have boys who LOVE pizza – they’d fall in love with these! 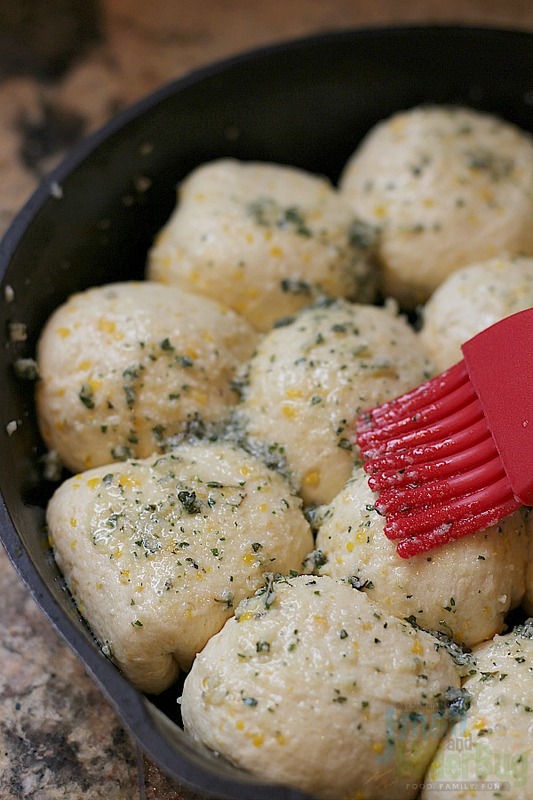 They sound flavorful and perfect for football parties! Wow these look super delicious. I would love to try these for the big game on Sunday! I have never had something like this before, but it looks so good! Seriously I am adding this to my list of “must make” ideas, I know my kids will eat this right up. It looks amazing!!! I can’t wait to make it for game day on Sunday! This looks absolutely yummy, I know I would love to make this for my upcoming girls night in. Now this is a perfect game day recipe. 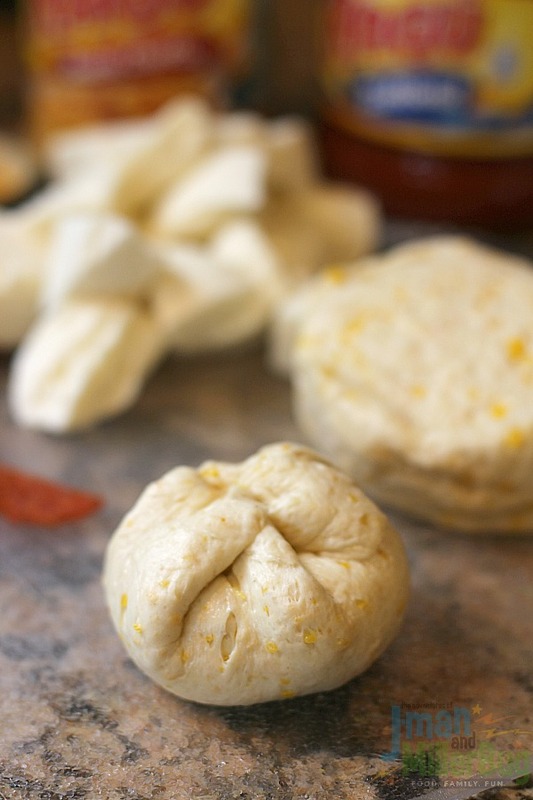 You can not go wrong with cheese bombs. Totally making these! This looks SO good! I am sure this will be a huge hit with my kids! OH!!! These look like a MUST for game day or even just for a fun appetizer anytime! I wish I had these in front of me right now. They look so amazing! !